I baked a cake this evening! This was my 3rd time baking a cake. Chocolate cakes I have made for the first two times, first was typically full recipe while second baking was using cake mix. Of course, second one was more successful as it was the easiest and simplest way for a beginner baker to bake a cake without much failure (chuckling). It’s typically a 3-step baking method: Mix, beat and bake. In order to save time, I used cake mix again, and chose “yellow” flavor this time. “Yellow”, I guess it should be original flavor… No indication of butter or vanilla used. Just called it “Yellow” on the box. It contains wheat and milk, and tastes like butter plus vanilla flavour. I supposed to get a chocolate frosting, too. However, I have forgone it as I wish to taste its original flavour as first time trial. 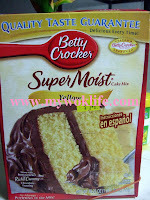 The cake mix used was from Betty Crocker brand, costs $3.65 per pack. My baking turned out pretty successfully, despite much lesser water was used (only 2 tablespoon of water). It was a little crispy on the surface (a cake crack shown might due to dryness or I shall shorten the baking time a little :p), but pretty tender and soft inside though. (Frankly, my cake was much denser where it supposed to be super moist, if original measurement of water [½ cup] added.) Its taste was pleasant with extra aroma. 1) Heat oven to 325°F (160°C) for dark or nonstick pan. 3) Beat cake mix, water, oil and eggs in large bowl on low speed for 30 seconds, then on medium speed for 2 minutes, scraping bowl occasionally. Pour into baking pan. 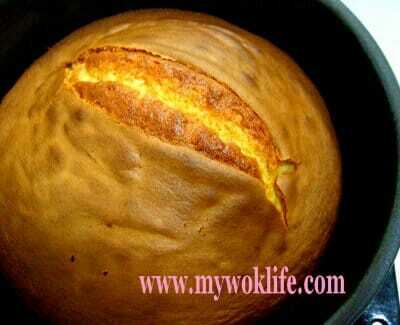 4) Bake for 30 – 35 min for dark and nonstick pan, or until toothpick inserted in the middle comes out clean. 5) Cool for 10 min before removing from pan. A slice of the cake counts about 100kcal. Just 40 min including baking time, with half a packet of cake mix for 9″ round cake, I had this delicious Yellow cake served. Tips: Higher heat of 350°F (180°C) if using shiny metal or glass pan. Bake for 25 – 27 min. That looks yummy. I think if there is ever “local” Singaporean cake, this is it. Great that you can make it at home – must be super fresh. u bake it with oven?? or anything else? Yes, I baked it with oven on 160°C.